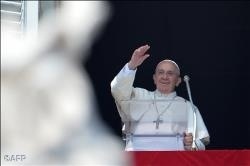 (Vatican Radio) Pope Francis prayed the Angelus with the faithful gathered in St Peter’s Square on Sunday, the second Sunday of Lent. Speaking ahead of the traditional prayer of Marian devotion, the Holy Father focused on the Gospel reading of the day, which tells the story of the Transfiguration. Three were the principal elements that Pope Francis identified in his reflection: the importance of listening, of being attuned and attentive to the Word of God; and the twofold movement of ascent and descent that characterizes the Gospel episode (Mt. 17:1-9), in which the Lord takes Peter, James and John to the top of Mt Tabor, reveals Himself in His glorified form, and returns down the mountain with them, with grave warnings to the disciples who accompanied Him not to speak of what they had seen.